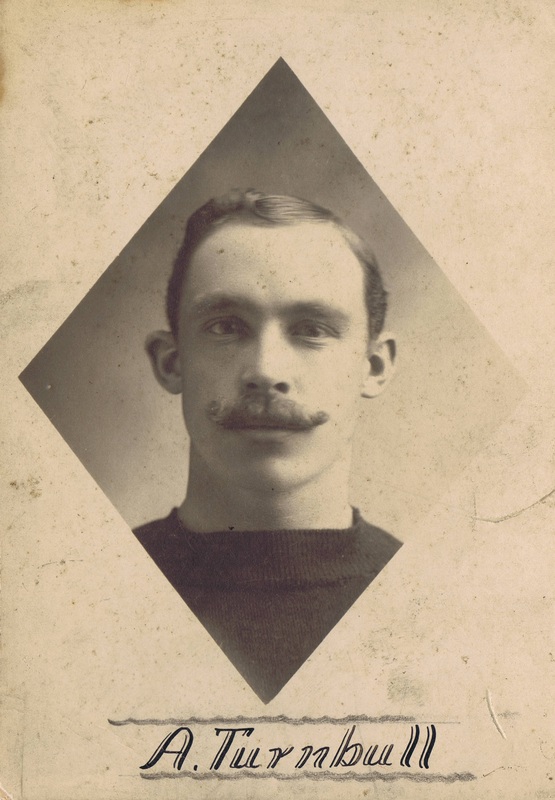 Born in either Stratford or nearby Paris, Ontario, Alex Turnbull played his earliest senior games starting in 1884 with an assortment of Toronto and area clubs. Newspapers mention such local teams as the Toronto Athletics, Paris Brants, Brockville, Perth, Toronto Junction, Toronto Elms, West Torontos, Peterboros – and then, lastly, the famous Toronto Tecumsehs. In the fall of 1897, Turnbull moved to British Columbia to ply his trade as a typesetter – first to Rossland and then onwards to New Westminster where he played with the New Westminster Salmonbellies from 1897 until 1909 with a brief comeback in 1918. On arrival in New Westminster, he took an immediate liking to the city and soon found employment with the fire department. A true legend on the field, ‘Dad’ was regarded, by the standards of his day, to be quite healthy for his age and a model athlete for his diet and regimen. Strong, agile, and a good sprinter, Turnbull was a fairly small player standing at 5 foot 6 inches and weighing in at 145 lbs. during his prime years. Notable for the era, he never drank and very rarely smoked and he was praised in newspapers such as the Ottawa Citizen for his temperance and “clean living”. The story behind his nickname ‘Dad’ – obviously play on his age – is that a Vancouver Daily Province writer wished it on him in 1908 after Turnbull had helped lead the youngsters of the New Westminster Salmonbellies back east to their first Minto Cup victory. Always drawing attention from the press for his remarkable, advanced playing age, there however appears to be some serious discrepancies reconciling the birth year of 1872 – which is the usual given year, based on handwritten notation in a Turnbull family Bible – with the start of his senior playing career in 1884. The details regarding his early life remain mysterious as the various dates associated often do not seem to stick. The Montréal Gazette noted in a 1908 article that he was aged 44 at time of publication (on July 31, 1908) and he would be 45 as of September of that year, which would imply he was born in 1863. It also would imply a different birthdate from that of December 6. This 1863 birth year would however better correspond with his senior playing career beginning in 1884, because otherwise he would have been 12 (if born in 1872) when he started playing senior lacrosse. Based on independent research, both the BC Sports Hall of Fame and this author came to the same conclusion: the earlier year of 1863 is more historically accurate and feasible than the family’s claim of 1872. To add further confusion, in an Ottawa Citizen reprint of a Vancouver Daily Province interview in 1917, his age at retirement in 1910 was quoted as being 42, which he neither confirmed nor denied – and which would then imply a birth year of 1868 thereabouts. The same article stated that he started playing senior in 1886, which conflicts with other newspaper reports. In the twilight of his career when the professional game came along, he had to stop playing in 1909 after suffering two broken ribs during a game, but made a comeback in 1918 at age 46. In later years, he was employed as the warden at the provincial jail in New Westminster. In April 1911, he made headlines in the newspapers as far east as the Ottawa Citizen when he was accidentally shot in the leg when one of the guards’ revolvers “exploded” while on duty as deputy gaoler. He later transferred to the land registry office where he worked until his retirement in 1946. In 1965, Alex Turnbull was posthumously inducted as a charter member to the Canadian Lacrosse Hall of Fame. Two years later ‘Dad’ was inducted into the British Columbia Sports Hall of Fame. 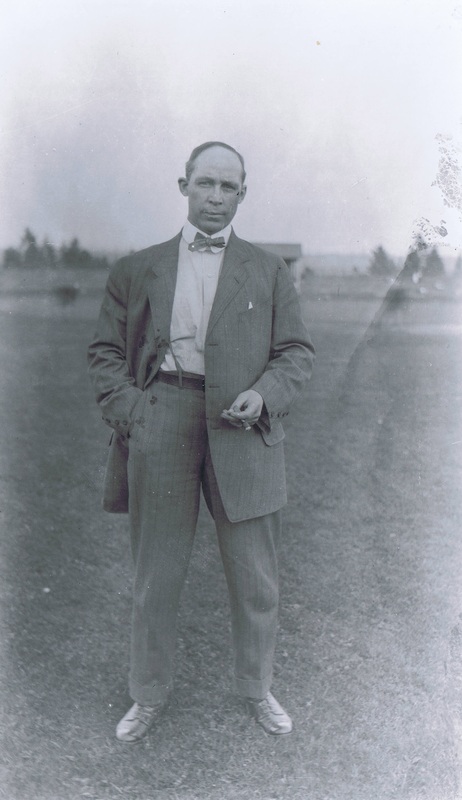 Alex Turnbull was a member of the Canadian Olympic team that won a gold medal for lacrosse at the 1908 London games. At some point during the 1970s, his gold medal from the Olympics was put on display at the Canadian Lacrosse Hall of Fame. Sadly, in the early weeks of January 1980, the hall of fame fell victim to one of a co-ordinated series of museum break-ins that occurred in Vancouver and New Westminster. The Canadian Lacrosse Hall of Fame, the Irving House Museum, the New Westminster Museum & Archives, the British Columbia Sports Hall of Fame, and some other locations, all suffered break-ins which resulted in the theft of around 20 irreplaceable and priceless gold-metal items from the premises. None of these items stolen in 1980 – including Alex Turnbull’s Olympic gold medal – have ever been located or recovered. Most likely all were melted down for their gold content. However the thieves, obviously professionals based on their co-ordinated targeting and timing, thankfully left the Mann Cup and Minto Cup unharmed during the break-in.